FortuneJack are one of the best Bitcoin and alt-coin casinos in the market. Their wide range of games, excellent welcome bonuses, ongoing promotions and long list of supported cryptocurrencies has made them a firm favorite for recreational gamblers. FortuneJack are a multi-cryptocurrency casino that first opened their doors in 2014. Their broad platform facilitates a vast range of traditional casino games and even live dealers. As an established casino (at least in terms of cryptocurrencies), FortuneJack offers a provably fair guarantee, which ensures that the player can trust that the games they play are fair. Further, not only does FortuneJack allow Bitcoin deposits and withdrawals, they offer support various other cryptocurrencies too. Moreover, their parent company – Nexus Group Enterprises Casinos, are fully licensed in Curacao, adding an extra layer of comfort for the player. This full FortuneJack review will tell you everything you need to know, with no stone being left unturned. Does not accept players from the U.K, Italy or the U.S.
Now that you have a good understanding of the types of games available, the net part of our FortuneJack review is going to look at what bonuses are on offer. Ultimately, Bitcoin casinos generally have less favorable welcome bonuses in comparison to their fiat casino counterparts, however this couldn’t be further from the truth at FortuneJack. This is because new players can claim a first deposit matched bonus of 110%, up to 1.5 Bitcoin (BTC), as well as 250 free slot machine spins. Once you have consumed your first bonus, FortuneJack will also give you additional reloads of between 50%-100%, up to a total of 3.5 BTC. 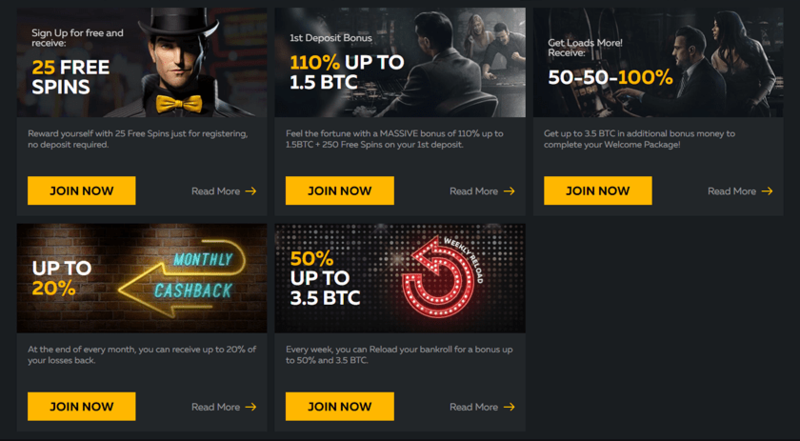 Alternatively, in a rare move for the crypto-casino industry, it is also possible to claim a free no deposit bonus of 25 slot spins, which is great way to test out of the platform before you spend your own money. To help you along your way, FortuneJack also offer monthly cash-back rewards on your losses, sometimes as much as 20%. There is also a VIP club available, for those who love the thrill of higher-stake gambling. This brings a variety of benefits, including but not limited to a personal VIP manager, exclusive VIP only bonuses, higher betting limits and even VIP only games. The FortuneJack platform offers one of the largest range of games in the crypto-casino industry. In fact, you will be hard-pressed to find a traditional fiat online casino that has a larger selection. First and foremost – as one would expect from most online casinos, all traditional casino games are covered. This includes the usual collection of blackjack, roulette and dice, as well as a significant amount of software slots including 3D slots, Video slots, Classic slots, and if you fancy your chances at a mega win, Jackpot slots too. In an unusual move for a Bitcoin casino, FortuneJack also has a live dealer section. This is where your cards are dealt or the roulette wheel is spun by a real-world person – all available in real-time. All in all, whatever your online casino preference, there is a good chance you will find it at the FortuneJack suite. Rather than pigeon-holing themselves to a single software provider, FortuneJack have instead decided to diversify by taking the best games from over 14 different entities. As you will see from the list below, the operator ensures that they only provide a platform for established software providers. Keep checking back, as new developers are being added all the time. The deposit and withdrawal department is potentially one of the greatest advantages to using a crypto-casino like FortuneJack. First and foremost, when registering there is no requirements to provide any personal details – apart from your country of residence and your email address. Your account will be opened instantly, which means you can deposit funds straight away. As a cryptocurrency-only casino, it is not possible to deposit directly using fiat currency, however there is a way to purchase Bitcoin and Litecoin through an in-built API protocol. This allows you to use a traditional Visa/MasterCard issued bank card, with the coins being credited straight in to your FortuneJack account. This is handy if you want to gamble with cryptocurrencies, but are yet to obtain any. It is actually the withdrawal process that is most impressive. When using a traditional fiat casino, it is usually a requirement to upload vast amounts of documentation, such as a passport and bank statement. This slows things down, as the payment department must first verify your identity before they can process a withdrawal request. Once this potentially drawn-out process has been completed, you must then wait between 3-5 working days before your card issuer refunds the payment back in to your bank account. On the contrary, FortuneJack ask for no documentation, nor do they need to verify your identity. Instead, once you decide to withdraw your winnings, they are normally back in your cryptocurrency wallet within a few minutes. This is something that other casinos would struggle to rival. Now that you know how FortuneJack fair in the deposit and withdrawal rankings, the next part of our FortuneJack review is going to let you know which coins are supported. To make things easier for you, we have listed them below. Unfortunately, although FortuneJack allow players to open an anonymous account, they state on their website that they do not accept registrations from the UK, Italy or the U.S. This is quite unusual, especially when one considers the nature of the blockchain framework. If one were to select a different nationality when registering an account, supported by an anonymous browser such as TOR, it would be very difficult for the casino to figure out where the player was located. However, to keep in line with their Curacao licensing requirements, FortuneJack must adhere to their regulatory conditions. Nevertheless, outside of the above prohibited nations, players from all other countries are free to join. As mentioned above, FortuneJack are fully regulated by the Curacao Gaming Board. This is a highly promising move by the operator, as it gives the casino an element of enhanced credibility. In essence, online casinos that focus exclusively on cryptocurrency deposits and withdrawals (i.e they have no relationship with real-world fiat money) are not required to follow the same set of regulatory red-tape. As a result, there is actually no requirement for crypto-casinos to obtain a gambling license from a regulatory body. However, the fact that FortuneJack have gone out of their way to obtain one shows that they are a casino to be trusted. Online gambling is often labeled as the Wild West, not least because of the amount of trust that players have to put in the casinos they deposit funds with. Imagine playing your favorite casino game online, but not knowing for sure that the odds on offer were actually legitimate. Thankfully, FortuneJack casino have installed a protocol know as provably fair. In a nut shell, this allows both the player and casino to independently verify that each gaming outcome is fair. This information is transparent insofar that anyone who wants to check it, can. There is no possibility for FortuneJack to override the provably fair protocol, and even if they tried, their attempt would flag up for all to see. To further protect player’s accounts, the FortuneJack website also has SSL encryption built in to it, which ensures that all of your data is fully protected from external malpractice. What would a casino be without customer support? For those who prefer a live chat experience, this is available 24/7 on demand. This is available in both English and Russian, with response times usually instant. In the odd occasion that Live Chat isn’t available, or you don’t have time to wait, you can also submit a ticket through your account. One slight negative to the support side of FortuneJack is that there is no telephone number to call. However, this is mainly because they are a global betting operator and a single telephone line would not suffice their international presence.